At St. Mary Catholic School, we want to offer to each member of our school – students, teachers, parents, staff – a path of holiness and happiness. The primary goal of our School is to help all our members become friends of Christ – that is, truly happy men and women, grateful and joyful. As a Catholic school, we believe that only in the mystery of Jesus Christ, does the mystery of man truly become clear. Jesus has revealed to us what it means to be human. For this reason, we understand education as a path of growth in both humanity and divinity, in human virtues and in friendship with Christ. 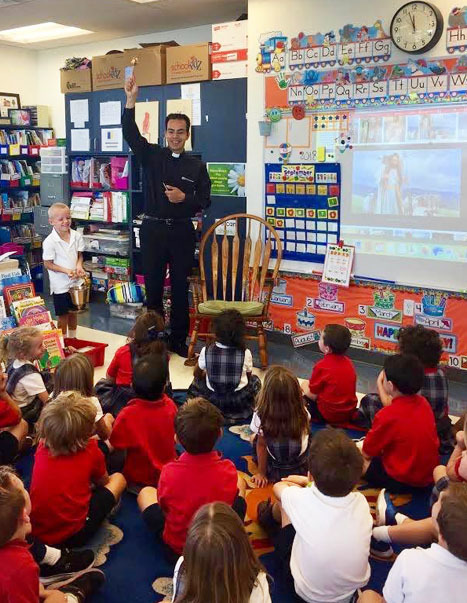 Everything that happens at St. Mary School – math, literature, music, prayer, sports – aims to further this path of holiness. Just as Jesus advanced in wisdom and age and grace, we want our students to grow as faithful Catholics and human persons. We want them to reach their full human potential – in other words, to become saints. 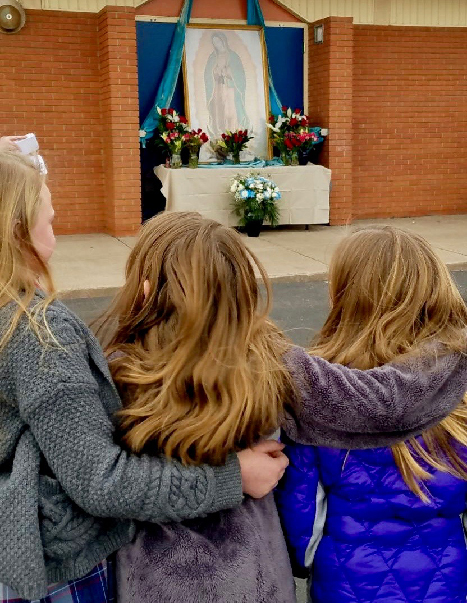 In a particular way, we want to grow as engaged Catholics who actively participate in liturgical celebrations, grow in knowledge of Church teachings and Scripture, share Christ’s love with others, trust in God’s love and forgiveness, and respect all life. Through the faith formation programs we offer, we encourage our students to grow in faith, virtue and prayer. Prayer is an integral part of the school day at St. Mary’s. Each morning, a student leads the school in prayer over the announcements. The entire school also pauses in the middle of each day to pray the Angelus. Teachers begin the day with their own prayer before the students arrive, and routinely start and end class with prayer. By incorporating moments of communal and individual prayer throughout the day, students learn to regularly offer their work, thoughts and heart to God. 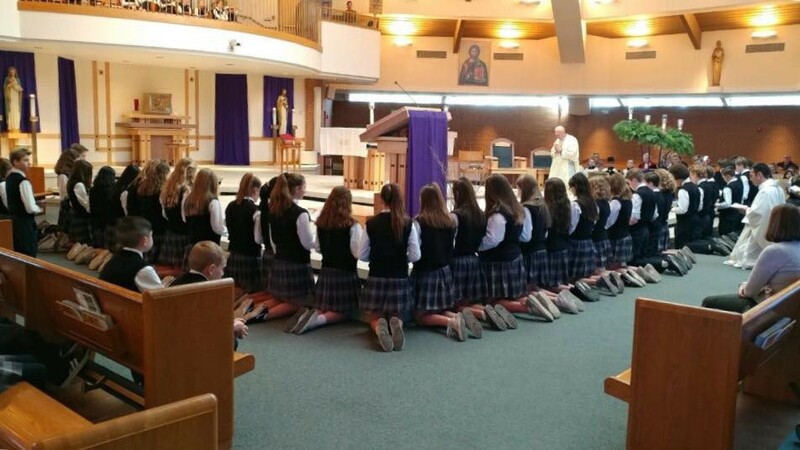 St. Mary’s celebrates a school Mass every Friday at 8:15 a.m. Each class takes a turn preparing the Mass and serving as lectors, altar servers, choir members, ushers and gift bearers. Friday Mass is a joyful time for us to worship together as a school community. The Mass also reminds us of our ultimate mission to build up the Kingdom of God by placing our gifts, studies and endeavors at the service of Christ. Students wear a dress uniform on Fridays to reflect the solemnity of the Mass. 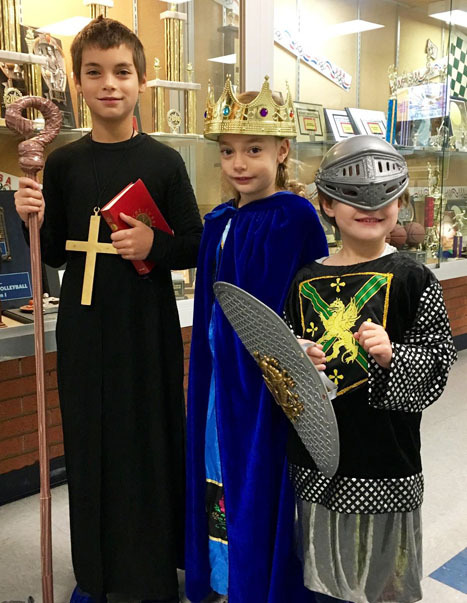 In addition to following the liturgical calendar of the Church, St. Mary School celebrates several special liturgies throughout the year. In September, we celebrate the birthday of Mary and her unique role as the Mother of God. We use this feast as an opportunity to celebrate the great gift of life and to remember with gratitude that we are sons and daughters of God the Father. In November, we celebrate All Saints Day. On this feast, we remember that God has called all of us to holiness – to sainthood! We reflect on the lives of the saints and their greatness of heart they each displayed in the (sometimes ordinary) circumstances of their lives. In February, we celebrate the Presentation of Our Lord in the temple in Jerusalem. We think about the generosity with which we should present our own lives to God and the courage to follow the specific path he has marked out for each of us. In a special way, we also remember our grandparents. Finally, in May, we celebrate the crowning of Mary as Queen of Heaven. This feast reminds us of our eternal destiny and the abundant life that awaits us in heaven. Every Wednesday night, in conjunction with St. Mary Parish, the Disciples offer the Nazareth program for grades K through 8. Just as Nazareth was the place where Jesus grew in wisdom and friendship with others, so the Nazareth program aims to be a place where young people can grow in virtue and friendship with each other. The program centers on the Gospel reading for the following Sunday and involves prayer, discussion, crafts and games. The students meet in small groups which are led by a high school student from the parish. St. Mary School offers confession to the students every Thursday. One grade (grades 3-8) has the opportunity to go to confession each week. In addition, confession is always available upon request or at the regularly scheduled times for St. Mary Parish. The adoration chapel at St. Mary Parish is open 24 hours a day, 7 days a week and is always available to students. 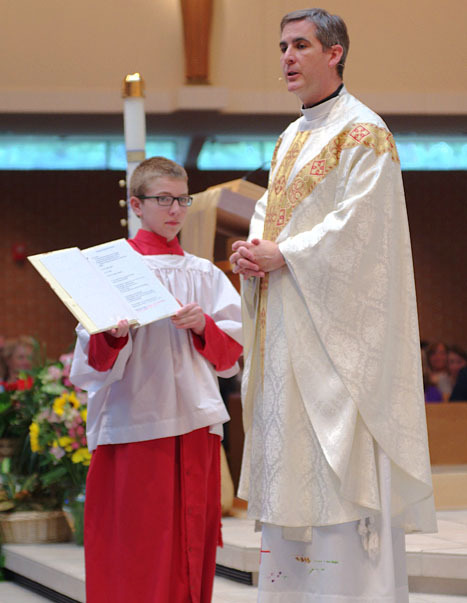 Middle-schoolers, particularly altar servers, are encouraged to visit Jesus Christ every week.